CCHS standout Justin Davenport committed to continue his basketball career at Maryville College during a program at the CCHS Library Friday (April 1). On hand were, sitting from left, Buddy Davenport (grandfather), Justin Davenport and Nancy Davenport (grandmother). Standing, from left, CCHS Athletics Director Michael Dodgen, Mike Davenport (father) and CCHS Head Boys Basketball Coach Matt Rigsby. 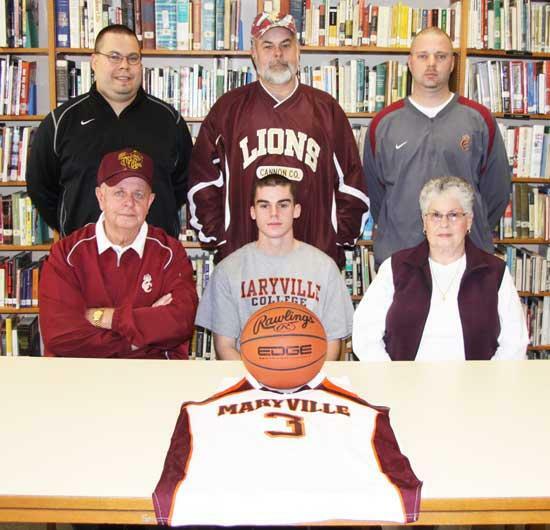 The most prolific scorer in Cannon County boys basketball history will continue his career playing for Maryville College in Maryville, Tenn.
Justin Davenport has committed to play college basketball for the Scots, a Division III national contender. Maryville does not offer athletic scholarships; however, Davenport has received an academic scholarship that will pay for an education totaling more than $140,000. "The main thing is that I get to do what I love, which is play basketball, and get a great education," Davenport said. "I am able to get my college paid for, plus more. It's a great situation." Davenport capped his illustrious career as the all-time leading scorer in Lions basketball history with 1,719 points - 259 more than the previous mark of 1,460. He became Cannon County's first District 8-AA Player of the Year since Spencer Rowland earned the award in 2001-02. Cannon County third-year Head Coach Matt Rigsby said Davenport's legacy is not his place in the record book, but his work ethic and dedication. "Justin Davenport left his legacy at Cannon County, not because of what he did in the record books, but how he was an example to others of where hard work takes you," Rigsby said. "He ran the mile in less than five minutes in conditioning. He was constantly in the gym working to improve his game. He would call or text late at night on the weekend wanting to get in the gym and work. People in the stands don't see that and the work that goes into a player having the career he did. "I will tell any kid in this county that if you put the effort and time in the gym over a period of however many years he has, good things will come to you. Justin has worked hard and he deserves this." The work ethic also led to improvement within the boys basketball program. Cannon County won one game the year before Davenport entered the program. Four years later he was part of a senior class that won 22 games and reached the Class AA Substate for the first time since 2000, which also happened to be the program's last 20-win season. "Justin is a welcome addition to our program," said Maryville Head Coach Randy Lambert, who just completed his 31st season leading the Scots. "I love his toughness and passion for the game. He has a point guard mentality with the ability to score big numbers. He is deadly from the 3-(point arc) with an excellent mid-range game. I am hoping he will quickly make the transition and be able to contribute next year." The heady point guard has improved his play each year and generally lived up to expectations, not of others, but himself. Davenport was named District 8-AA Freshman of the Year in 2007 and gravitated into the top player in the league by his senior season when he averaged 21.6 points, 3.8 rebounds, 3.6 assists and he shot 45 percent from the field, 43 percent from 3-point range and a staggering 89 percent from the free-throw line. "I wanted to go somewhere and have a chance to play immediately," Davenport said. "They didn't promise me anything but if I keep progressing I feel like I can play quickly and that was important for me. I have worked so hard for this and I wanted to go somewhere that I have a chance to play earlier." Davenport will be playing for one of the top Division III teams in the nation at Maryville, which has maintained a level of excellence under Lambert. Over the last 10 years, Maryville has produced 10 consecutive NCAA Tournament appearances, two Sweet 16 appearances in the National Tournament, 10 consecutive Great South Athletic Conference regular season titles, eight Great South Athletic Conference Tournament championships and 247 wins. "Maryville has a great program and it is a dominant team," Davenport said. "I want to have a chance to win a national championship. We can do that at Maryville." Davenport will be joining a Scots basketball team that finished the 2010-11 season with a 16-10 record and won the GSAC championship. way to go Justin! looking forward to seeing you play at the next level. Congrats Justin, Michael, Buddy, and Nancy! I believe I see some overnight travel for the family!